If you've spent thousands of dollars acquiring a smartphone like the iPhone, then you know you must protect it in the best way you can so it won't de-value quickly. 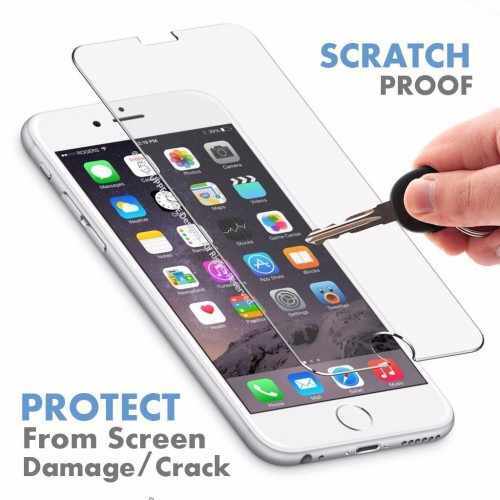 One of such ways is to ensure that the screen is not marred by scratches or cracks with the use of one of the best-tempered glass screen protector for iPhone devices like the iPhone 6, 6S, 7, iPhone 8 and iPhone X. The ease at which your phone can slip from your hands while being operated or fall from a table means this is not something you should spend time considering first. A cracked screen is inevitable no matter how careful you are. Sooner or later, it'll happen even on a device with a Gorilla Glass screen. A tempered glass protector is a hardened glass screen that is 0.3 mm to 0.5 mm thick. Its hardness is as a result of the compression of its glass through a series of processes, which give it its strength. A tempered glass screen has a degree of toughness which helps to protect a device's screen from scratches and cracks that may occur when the device falls from certain heights or comes in impact with sharp objects. The difference in appearance and feel from the original screen may not be noticeable when placed on a screen because of their similar texture and cut-out design. Why do You need a Tempered Glass Screen? An iPhone's screen is its beauty. It makes the phone look appealing to the eyes. In the same vein, you can grow to despise the phone once it cracks, and the cracks keep stretching across the screen. For the most obvious reason, you need a tempered glass to protect your phone's screen from the effects that could be caused by scratches on the screen. More scratches on a screen can affect the display screen's structure, making it more susceptible to cracks. But then there are more reasons I can give. If you've ever had your thumb bleed while operating your own phone due to the cracks on your screen, then you need a glass screen protector. If by any chance the tempered glass gets damaged, you can take it off and replace it, which is easier and cheaper compared to changing the phone's screen that will require a professional to do it. Not limited to these, but they are some of the benefits of using a third-party screen protector on your iPhone. My iPhone has a Gorilla screen, and Apple offers an iPhone screen repair option. 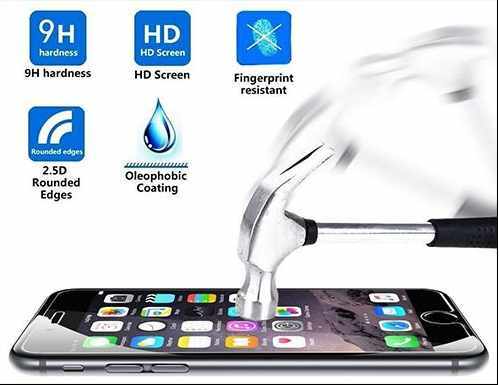 As much as a Gorilla screen is just as effective, what if you could add an extra layer of protection to your iPhone's screen to make it scratch-proof, waterproof, oil proof and fingerprint proof? Now, that'd be a yes! Keep in mind that there are different kinds of glass protectors, each having its own level of strength. Their strength/toughness determines the height the phone will fall from, the object it will come in contact with and how long it'll withstand the impact of falls before it finally cracks. Given below, is a list of the most popular and best iPhone screen protectors that will help to maintain the device's sleek design and at the same time give its screen durability. Here is a list of pro glass screen protectors for iPhone that does not reduce the quick responsiveness of your screen when applied to it. This is one of the best iPhone glass screen protectors which is 0.3mm thickness, slim enough as it sits perfectly on the device's screen. It makes the screen scratch proof and gives it an oleophobic coating that makes oil/dirt on the fingertips not visible on the screen. The 5.5-inch size of this screen protector means that it is designed for these iPhone models 6s Plus, 6 Plus, 7 Plus, and 8 Plus. Coupled with the toolkit for this glass protector is about two to three different amFilm glass protectors, meaning that for your money' worth, you can replace the glass as often as you'd like to. This is a standard tempered glass screen for iPhone mainly designed as a screen protector for the iPhone 8, 7, 6s, and 6 judging from its size. Like the amFilm, it provides up to 2 screens for the user to be able to switch to the other when the other has become old. This is one of the best-tempered glass screen protectors specially designed for the iPhone 6 and 6S. It is a Japanese tempered glass with a 9H+ scratch resistant screen to scratch proof your iPhone. Otuim screen protector is water resistant as well as making oil and dirt from the face and fingertips invincible. It does not require technical knowledge before one can apply it to their screen since following the well-detailed guidelines in the toolkit is enough to guide the basic user through it. ARKTeK is another tempered glass screen protector for iPhone that features a Japanese Asahi Glass. It is slightly thick with nice round edges, making it hard to notice that there's an extra screen on your iPhone. Based on its 4.7-inch size, it's primarily designed for pocket-friendly iPhone smartphones like the iPhone 6. Tech Armor is a premium ballistic glass screen protector for the iPhone. It does not affect the responsiveness of your screen, neither does it tamper with its resolution. In either case, your clear and bright screen is maintained, as well as its fast responsiveness. Like the others, oil smears, fingerprints, and dirt are not visible on this tempered glass as a result of its oleophobic coating. Each of these glass screen protectors can be purchased directly from Amazon. Even though Apple offers an iPhone screen repair option for the iPhone 7, 7 Plus, 8, and iPhone 8 Plus at $29, some of these screen protectors are cheaper, for as low as 7$. While it saves you the time of waiting for your phone to be fixed and more expenses, if you're like me that doesn't like your phone to be tampered with, then you need a screen protector for your iPhone.